The Prince George's County NAACP is calling for the county's executive to wait to renew the school system CEO's contract until an investigation into allegations of widespread grade changing has ended. "It is with great concern that we write this letter requesting that you halt Dr. Kevin Maxwell’s contract renewal," Prince George's County NAACP President Robert Ross said in a letter addressed to County Executive Rushern Baker. The letter sent on Wednesday states PGCPS CEO Kevin Maxwell's contract renewal set for July 1 is based in part on a significant boost in graduation rates and allegations of grade tampering have called Maxwell's credibility into question. "Dr. Maxwell just signed a very lucrative four-year contract with a compensation package of more than $450,000 per year," Ross said. 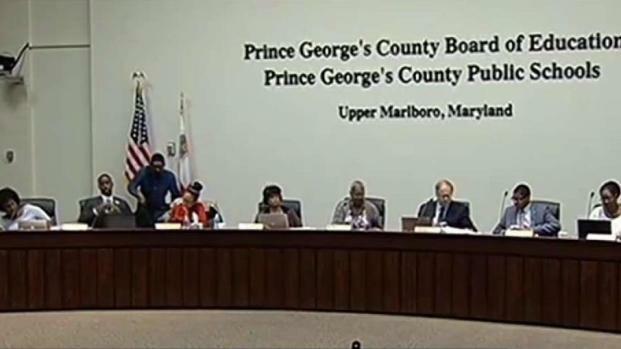 The CEO of Prince George’s County Public Schools asked the Maryland State Board of Education for a thorough review of allegations of widespread grade changing to boost graduation rates. County Bureau Chief Tracee Wilkins reports. Ross calls for Baker to change Maxwell's title to Interim CEO starting July 1. "If no wrongdoing is found, Dr. Maxwell may once again be given the title, 'Chief Executive Officer' and his four-year contract remain intact and be reinstated. However, if the investigation shows criminal behavior, we believe it is in the best interest of the taxpayers not to have to buy him out of his contract," Ross said. On Tuesday, Maxwell asked the Maryland State Board of Education for a thorough grade tampering investigation. "I categorically deny any accusation of a systemic effort ordered by me or others acting on my behalf to promote students," Maxwell wrote in a letter. Nine county school board members, including the chair and vice chair, signed the letter. Gov. Larry Hogan made the same request Sunday. Maryland Superintendent Dr. Karen Salmon read the letter during the state board's meeting in Baltimore Tuesday. "Please know you can expect full cooperation from me, my executive team and anyone else you deem pertinent," Maxwell wrote. The board voted Tuesday in favor of an independent, third-party investigation. "We don't have any evidence of this yet," board Chair Andrew Smarick said at Tuesday's meeting. "These are just allegations. This implicates the reliability of data, and we want to make sure the kids are well served." Maxwell said no one on his team has told people to change grades that shouldn't be changed. He also said graduating more students is a primary goal of the school system. "We are giving the kids second chances," he said. "Kids deserve second chances, and we're working to graduate more children so they have those post-secondary opportunities." "I revealed what was going on in the schools, and they said they were hearing the same things," said one of the first teachers to make the allegations. She wants to remain anonymous. "If you don't change the grade or don't approve the work, your principal has the authority to do what's called an administrative override, and they can change the grade for you," she said.